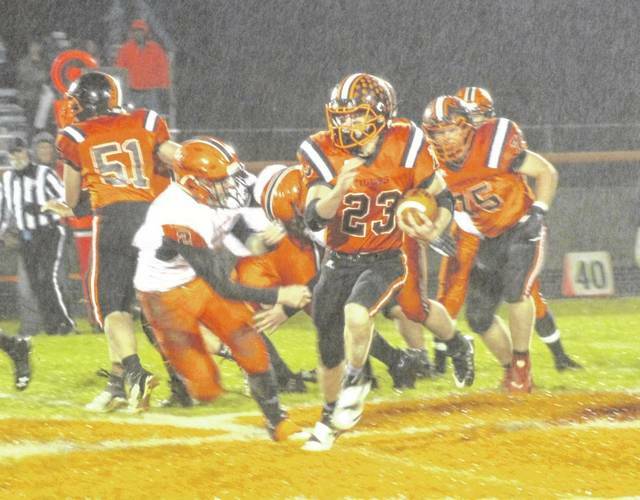 Ansonia junior Brock Shellhaas (23) got the scoring started with this 54-yard touchdown run on the Tigers first play from scrimmage on Friday night. Ansonia defeated Bradford, 41-6. 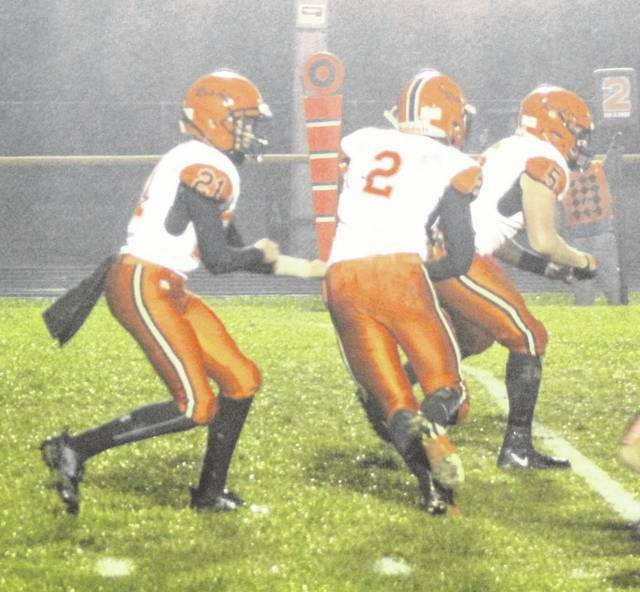 Ansonia defenders Ethan Fischer (5), Reece Stammen (7) and Hunter Muir (27) take down Bradford ball carrier Hunter Gheen on Friday night. Ansonia defeated the Railroaders, 41-6. Bradford quarterback Taven Leach (21) hands the ball off to Hunter Gheen during the first half of the Railroaders game at Ansonia on Friday night. The Tigers defeated Bradford, 41-6. 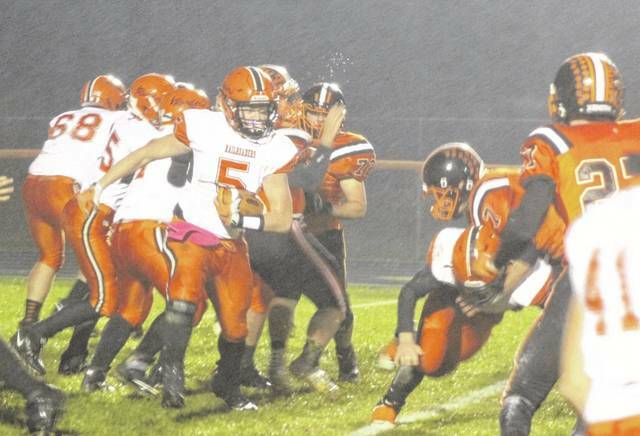 Bradford running back Wyatt Spangler (5) looks head for a way to avoid a pair of Ansonia defenders on Friday night. The Tigers defeated the Railroaders, 41-6. Ansonia’s Hunter Muir (27) and Andrew Rowland (75) combined for a tackle against Bradford’s Wyatt Spangler on Friday night. The Tigers defeated the Railroaders, 41-6. 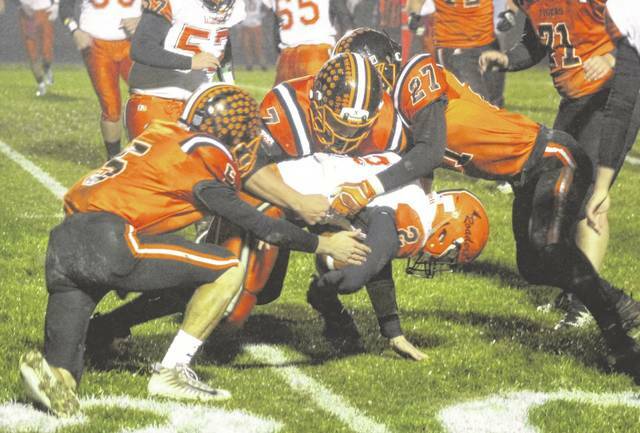 ANSONIA – It was a foregone conclusion coming into Friday night that Ansonia would be playing beyond Week 10. 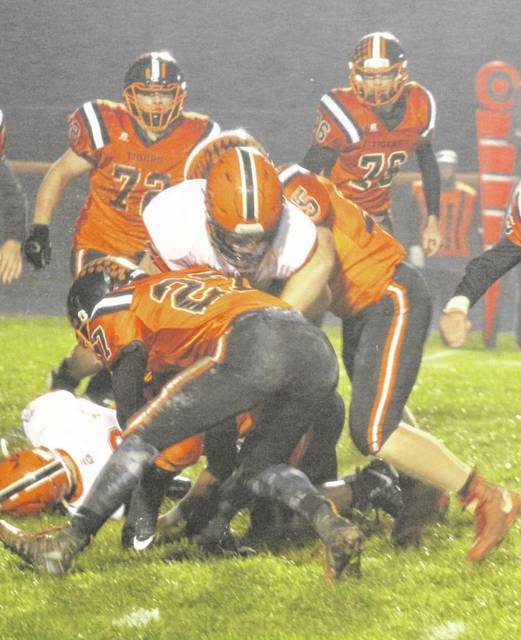 The Tigers knew, win or lose, the 2018 season would be its second straight with a postseason appearance, but they still didn’t take any plays off on a dismal, rainy night in defeating winless Bradford, 41-6. The season went so well that Ansonia appears to have earned the fourth seed in the Division VII, Region 28 rankings which will give them a home playoff game. The rankings are still unofficial, however. They won’t be confirmed until Sunday afternoon, but as of Friday night the Tigers look likely to be hosting Sidney Lehman Catholic at 7 p.m. on Saturday, Nov. 3. 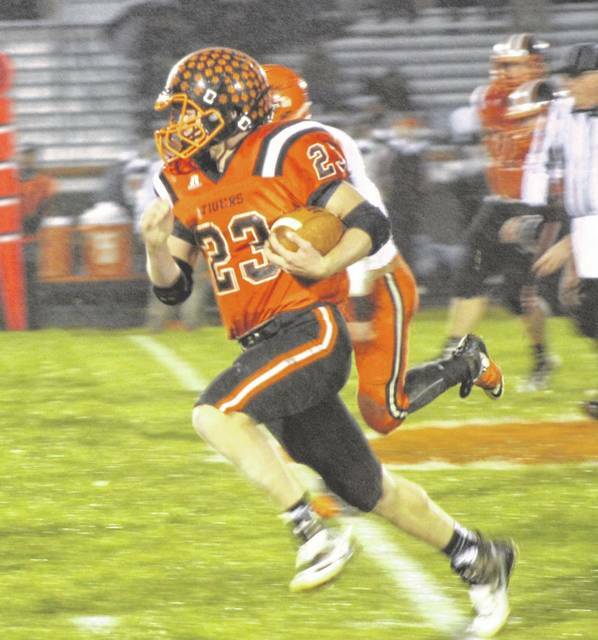 Ansonia (8-2, 7-1 Cross County Conference) didn’t waste any time in taking a lead against the Railroaders when junior Brock Shellhaas took off on the first play from scrimmage for a 54-yard touchdown run and a 7-0 lead with 11:41 on the clock. A few minutes later, Ethan Fischer scored the first of his two touchdowns on the night with a 6-yard run and a 14-0 lead. 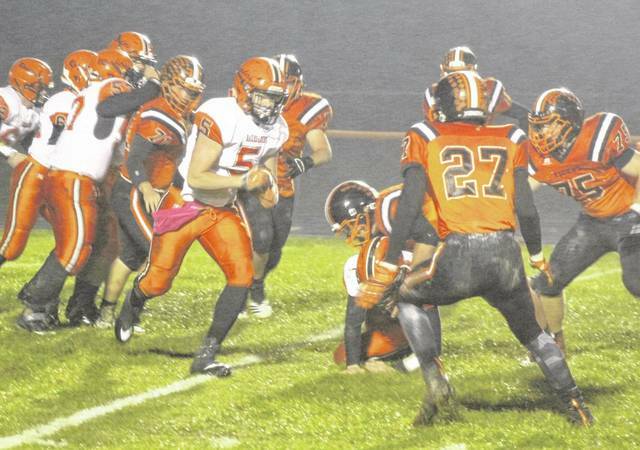 Two minutes more had gone by when Reece Stammen broke free for a 25-yard scoring run. With a little more than three minutes to go in the opening quarter, Matthew Shook got into the act as well with a 20-yard touchdown run and the Tigers took a 28-0 lead into the second period. 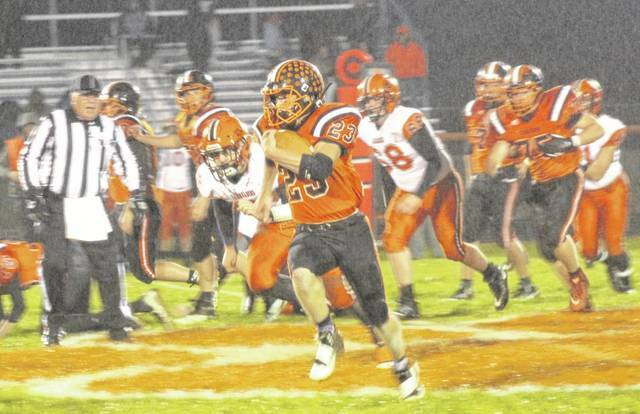 Ansonia went up 35-0 when senior Devin Sink burst into the open field for a 65-yard touchdown. Fischer added a 73-yard touchdown run in the fourth quarter for the final points of the game. Bradford did manage to put 6 points on the scoreboard in the second quarter when Josiah Brewer intercepted an Ansonia pass and ran it back approximately 30 yards for a touchdown. The PAT was blocked. It has been a long season for Bradford, which finished the year 0-10 overall and 0-8 in the CCC. The Railroaders’ season was filled with adversity as they consistently played with 13 kids week-in and week-out. Just a few weeks into the preseason back in August, Bradford’s coach stepped down nearly forcing the cancellation of the season. John Cruse stepped into the head coaching role and he said the kids never quit on him despite the inability to simulate real-time practices. “Someone had to step up,” Cruse said. “The seniors were my main concern. They needed to have an opportunity to finish the season out. They deserve it just like anybody else does, and the rest of the team did too as far as that goes. It’s a great bunch of kids. They worked hard and came to practice every day and did the best they could. Cruse heaped plenty of praise on his players for their undeniable grit and determination, but he also thanked the many coaches in the league for their words of encouragement. Coach Hoening had a few words of praise for the Bradford players as well. This entry was tagged Andrew Rowland, Ansonia Tigers, Bradford Railroaders, Brock Shellhaas, CCC, Devin Sink, Ethan Fischer, Eugene Hoening, Hunter Gheen, Hunter Muir, John Cruse, Taven Leach, Wyatt Spangler. Bookmark the permalink.